Installing and managing codecs on our computer can be a somewhat complex task because there can be incompatibilities between them or they may not be properly updated. 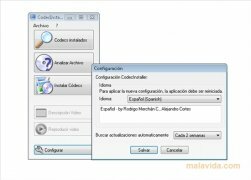 CodecInstaller is a magnificent tool that will help us our with this sort of problem, because it's a program capable of analyzing what codecs we have installed, analyzing any kind of multimedia file to check what we need to be able to play it and even downloading the most popular codecs straight from its interface. The interface is divided into four main parts: the start menu (from which we will be able to choose what we want to do), the file analysis window (that will show us all the information about any multimedia file of our choice), the code manager (where we'll be able to see what we have installed on our computer) and the codec installer window. If you're looking for a total solution to be able to view your films and listen to your albums properly, download and try CodecInstaller.